Marketers Investing In More Audience Data; Expenditure Up 37% In U.S. In the programmatic ad-buying world, audience data has become increasingly important. And that's because one of the promises of programmatic is the ability to decouple your audience from specific content. Yes, content still matters. But programmatic tech, in theory, allows your to follow your audience everywhere -- not just where it’s obvious. In order to do that effectively, however, marketers need a trove of audience data. That's part of the reason that data has been called the new currency by some. So who is investing in it? In short, everyone. But Eyeota, a data management firm, broke down audience data expenditure by region and sector to give the industry more insight into who exactly is going all-in on audience data. The automotive, financial, electronics, services and utilities, and “fast-moving” consumer goods industries were the biggest spenders when it came to acquiring new intent and audience data during Q4 2014. The automotive sector, led by luxury brands, increased worldwide audience data spend by 77% from Q3 2014 to Q4 2014, per Eyeota. Financial advertisers increased their spend by 35% quarter-over-quarter. Sports marketers increased their investment in audience data more than any other sector in Q4 2014 -- compared to what they spent in Q3 2014 -- followed by the multimedia and home & garden sectors. When looking at different regions from around the globe, Eyeota concluded that the maturity of the market (i.e., country) in terms of its programmatic adoption dictates how much more marketers in those respective markets are investing in audience data. “For example, the United States is one of the most mature markets for programmatic,” writes Eyeota, “which explained reduced but steady growth during Q4 2014.” Marketers in the U.S. spent 37% more on audience data in Q4 2014 compared to Q3 2014. In Europe -- another more mature programmatic market -- audience data spend increased 39% quarter-over-quarter, a steady rate of growth but “still lower than overall growth in Europe,” notes Eyeota. In the APAC region, however, which is still catching up on all things automation, audience data expenditure increased 101% quarter-over-quarter. In Australia, one of the more developed markets in the APAC region in terms of programmatic adoption, growth was a little more steady, checking in at 49%. “This steady growth was expected for the UK and Australia as they are both advanced programmatic markets in their respective regions,” writes Eyeota. 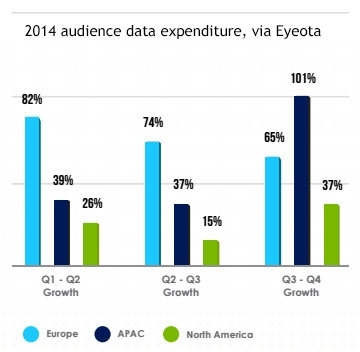 Eyeota plans to issue an audience data index on a quarterly basis, with a Q1 2015 update expected soon. 4 comments about "Marketers Investing In More Audience Data; Expenditure Up 37% In U.S.". Ed Papazian from Media Dynamics Inc, May 21, 2015 at 1:46 p.m.
Tyler, it would be helpful if your source had information on the kinds of "audience" data that marketers are subscribing to and what it is used for. For example, I doubt that many marketers are buying Nielsen's TV ratings, but they may be getting one or more of the digital audience measurement services. They may also be involved with "big data" sources, though this may not relate directly to TV time buying. Also, it's easy to register seemingly large upticks in such spending when one starts at zero or has a very small investment in such data. Is there anything more your source can tell you along these lines? Tyler Loechner from MediaPost, May 21, 2015 at 2:55 p.m.
Hey Ed, I will definitly reach out on this. They are in Singapore right now so probably won't hear back until tomorrow, though. And I agree that it's easier to register large upticks when you start at zero, but none of these upticks were so large (most were in the double-digit range) that it detracted from the premise, in my opinoin. You are definitly right though -- and the concept was addressed in the report; the more advanced markets (i.e. those that have been investing in audience data for longer) were still boosting spend, just not as quickly as the others. I'll keep you posted here. Tyler Loechner from MediaPost, May 22, 2015 at 10:26 a.m.
"Eyeota is a third-party audience targeting data supplier, therefore the Eyeota Index reflects the use of third-party audience data worldwide. While there are different types of audience data, the Eyeota Index reflects audience data that is used for targeting of digital advertising campaigns worldwide." He added: "We have attempted to only include insights where we have a strong foothold in market or for the mentioned sector. Where relevant, we have validated any major upticks in our Eyeota Growth and Price Indices as being caused by newcomers to audience data." Ed Papazian from Media Dynamics Inc, May 22, 2015 at 11:36 a.m.
@Tyler, thanks for the follow up. So it appears that they were not really talking about syndicated audience research in the traditional sense, and certainly not about non-digital advertising, but mainly "third party" data----which could be provided by a digital seller, for instance, and other sources. That makes sense. Advertisers duplicating their agencies by buying Nielsen, MRI, RenTrak, ComScore, etc. is much less likely---though not out of the question if they start to go "in-house "with media.